Modular-Lab PharmTracer is your solution for efficient routine production of radiopharmaceuticals and research. It uses disposable cassettes containing all the necessary components for a particular synthesis. By customizing the synthesis cassettes and adapting the projects in the software new tracers and processes can easily be developed. Please note: We have optimized our Modular-Lab PharmTracer for the use of 18F-Tracers. New software templates and new cassettes are available for 18F-FDG, 18F-NaF, 18F-FET, 18F-FLT and 18F-FMISO. For more information please download the overview of available F-18 systems below. 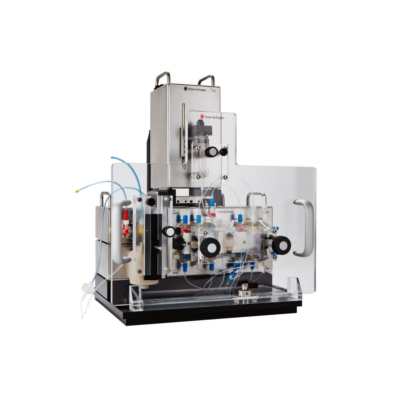 The laboratory equipment Modular-Lab PharmTracer has been specifically designed to allow versatile and efficient routine production of different tracers, complying with GMP requirements. The concept of disposable cassettes enables the user to easily label different radionuclides with the same setup, but without the risk of cross contamination. The system retains the reliability and versatility of the Modular-Lab Standard system, allowing to make changes in the process as necessary during early-stage development, but then “lock-in” the process for routine production. With this addition, Modular-Lab PharmTracer is the ideal platform for development as well as production of radiopharmaceuticals. The Modular-Lab PharmTracer setup for the labeling of 68Ga-, 111In-, 177Lu- and 90Y-DOTA peptides will be combined with a Heater Reaction Module (HRM), a Syringe Module (SYM) and, if necessary, with an additional 1-fold Module (SLM-1) when performing the a presure test before the synthesis. Sterile disposable cassettes ensure easy handling by click‘n’start technology. The easy-to-program intuitive graphical interface of the Modular-Lab software is used to control or adapt the synthesis process. By simply adding modules the setup can be rearranged for use with 18F tracers. Using the cartridge-based SPE purification approach, the basic Fluorine-18 PharmTracer setup, consisting of the Heater Module (HRM), the Syringe Module (SYM), the 4-fold Module (SLM-4), the 2-fold Module (SLM-2) and a vacuum pump, will enable the production of [18F]FDG, [18F]FET, [18F]FLT and [18F]FMISO. A heater and SLM-4 will not be required when producing [18F]NaF. Further combinations allow the production of 11C, 64Cu and other tracers. More detailed information can be provided upon request. All cassettes are assembled under GMP-compliant clean room conditions, sterilized with gamma-radiation and double-vacuum-packed. The consumables used are chemical resistant and have been tested for their suitability with the specific syntheses. A shelf life of 18 months can be guaranteed. Cartridges are included and preconditioned automatically if necessary. Due to the cassettes one-time use no cleaning, drying or sanitation routines are necessary. 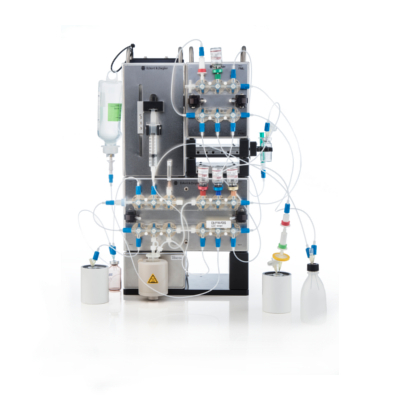 Modular-Lab PharmTracer is based on a unique, modular approach combining the speed and safety of a remote, fully-automated system with the option to configure syntheses for novel tracers. The GMP-manufactured sterile disposable cassettes avoid intense cleaning and sanitation routines. The synthesis process is programmed by Eckert & Ziegler Eurotope making additional programming dispensable. Modular-Lab PharmTracer’s multifunctionality supports routine production of 18F-, 11C-, 68Ga-, 111In-, 177Lu- and 90Y-DOTA peptides. The setup can also be combined with an analytical HPLC and TLC. The intuitive user interface complies with GMP, cGMP, GLP and GAMP 5 requirements. Parameters such as temperature, activity detector readings, flow rates, or valve settings can be monitored easily in one window. Reports containing all relevant data and information are created automatically after each run. In addition, a cost and space efficient alternative to the conventional electrical cabinet (EC) is now available for specific systems with low power consumption. It consists of the EC mini in combination with the software Modular-Lab SoftPLC. Apart from this versatile system, Eckert & Ziegler also offers additional alternatives from the Modular-Lab family. 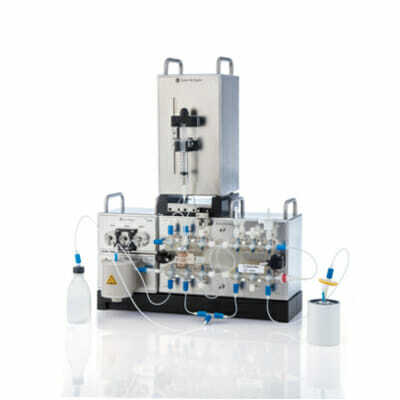 Modular-Lab Standard uses a tubing-based approach and has been specifically designed for research and development of radiotracers, whereas Modular-Lab eazy provides a space and cost efficient solution for cassette-based routine production of Theranostics tracers. With KitLab we offer a stand-alone solution for automated cold kit labeling and more.